It turns out I have lots of thoughts about the new tax bill. I'm jotting them down here for posterity. I'll start off by claiming a few opinions I have about the US tax system. I think lower corporate taxes are a good thing. I think payroll taxes are regressive, disincentivize hiring, and are a bad thing. I think we should shift more of the tax burden to passive income and gains. I think many elements of the corporate tax system encourage bad corporate behavior. So what are the problems I think can be addressed with smarter tax policy? The US productivity rate, private investment, and asset prices are at all time highs. Meanwhile, inflation-adjusted wages have remained flat for the last 40 years. Stagnant household incomes are failing to keep up with skyrocketing costs of living: healthcare, education, and housing, which now consume well over half of household budgets , are compounding far faster than the rate of inflation . This leaves the federal government footing unnecessary bills in the form of ballooning Medicare/Medicaid outlays, $1 trillion annual unemployment and poverty alleviation spending, and rising education debt default write offs. 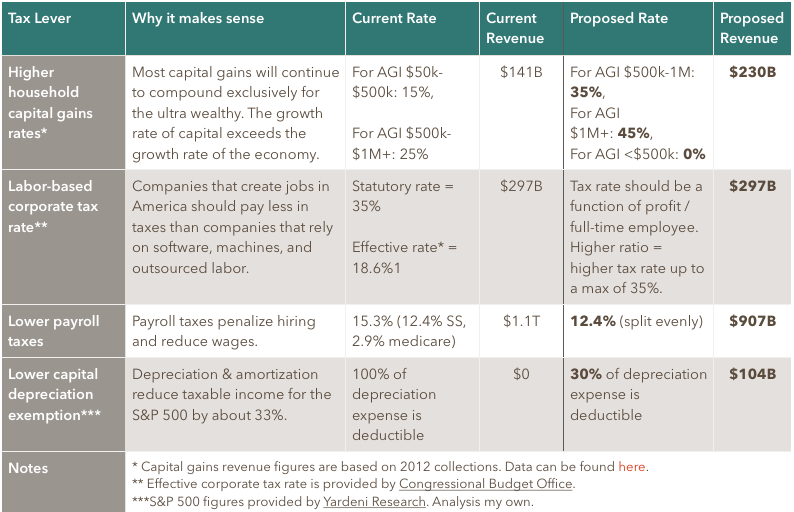 In addition to revenue generation, taxes have the unique capacity to influence economic side effects like those mentioned above. Plenty of today’s tax policies thoughtlessly exacerbate harmful economic outcomes by acting as bad incentives. I've come up with a few ways to mitigate bad economic outcomes, mostly by rewarding socially beneficial corporate behavior. The four tax levers I'd pull would create the right incentives to steer our economy to a more inclusive, growth oriented future by shifting tax liabilities away from job-creating business activities and toward shareholders, and rethinking corporate taxes to be pro-labor instead of pro-capital. I've made a table that describes these policy levers in high level detail (capital gains rates, corporate tax rates, payroll tax rates, and depreciation exemption). In a separate note, I'll review the status quo and implications of these taxes, and assess the distributional, administrative, and revenue effects of shifting these tax levers the way I'd like to.